Ahram Online publishes a translated version of the "Declaration of Principles" signed by Egypt, Sudan and Ethiopia in a step to put an end to a four-year dispute over Nile water sharing arrangements among Nile Basin countries. Ten principles are outlined in the document signed by the three countries. - Cooperation based on mutual understanding, common interest, good intentions, benefits for all, and the principles of international law. - Cooperation in understanding the water needs of upstream and downstream countries across all their lands. The purpose of the Renaissance Dam is to generate power, contribute to economic development, promote cooperation beyond borders, and regional integration through generating clean sustainable energy that can be relied on. - The three countries will take all the necessary procedures to avoid causing significant damage while using the Blue Nile (the Nile's main river). - In spite of that, in case significant damage is caused to one of these countries, the country causing the damage [...], in the absence of an agreement over that [damaging] action, [is to take] all the necessary procedures to alleviate this damage, and discuss compensation whenever convenient. - The three countries will use their common water sources in their provinces in a fair and appropriate manner. a. The geographic, the geographic aquatic, the aquatic, the climatical, environmental elements, and the rest of all natural elements. b. Social and economic needs for the concerned Nile Basin countries. c. The residents who depend on water sources in each of the Nile Basin countries. d. The effects of using or the uses of water sources in one of the Nile Basin countries on another Nile Basin country. e. The current and possible uses of water sources. f. Elements of preserving, protecting, [and] developing [water sources] and the economics of water sources, and the cost of the procedures taken in this regard. g. The extent of the availability of alternatives with a comparable value for a planned or a specific use. h. The extent of contribution from each of the Nile Basin countries in the Nile River system. i. The extent of the percentage of the Nile Basin's space within the territories of each Nile Basin country. - To apply the recommendations of the international technical experts committee and the results of the final report of the Tripartite National Technical Committee during different stages of the dam project. a. 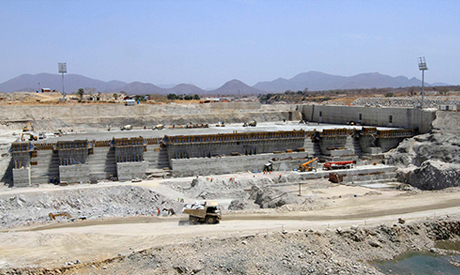 An agreement on the guidelines for different scenarios of the first filling of the Grand Ethiopian Renaissance Dam reservoir in parallel with the construction of the dam. b. An agreement on the guidelines and annual operation policies of the Renaissance Dam, which the owners can adjust from time to time. c. To inform downstream countries, Egypt and Sudan, on any urgent circumstances that would call for a change in the operations of the dam, in order to ensure coordination with downstream countries' water reservoirs. - Accordingly the three countries are to establish a proper mechanism through their ministries of water and irrigation. - The timeframe for such points mentioned above is 15 months from the start of preparing two studies about the dam by the international technical committee. - Downstream countries will be given priority to purchase energy generated by the Grand Ethiopian Renaissance Dam. - Egypt, Ethiopia and Sudan will provide the information and data required to conduct the studies of the national experts committees from the three countries in the proper time. - The three countries appreciate all efforts made by Ethiopia up until now to implement the recommendations of the international experts committee regarding the safety of the dam. - Ethiopia will continue in good will to implement all recommendations related to the dam's security in the reports of the international technical experts. The three countries cooperate on the basis of equal sovereignty, unity and territorial integrity of the state, mutual benefit and good will, in order to reach the better use and protection of the River Nile. The three countries commit to settle any dispute resulting from the interpretation or application of the declaration of principles through talks or negotiations based on the good will principle. If the parties involved do not succeed in solving the dispute through talks or negotiations, they can ask for mediation or refer the matter to their heads of states or prime ministers. All I see is a collection words that gives no power on its own dam. Rather the agreement should be based on the amount of water share each and every country should have. Why is it all focusing on GERD anyways? They have built dams without Ethiopian consent. Look carefully, if the other 2 downstream countries build new ones and ask Ethiopia to release more water to fill the new dams, GERD may not have water someday. This document is all about GERD. But if Ethiopia singes such a trash document, eventually Ethiopia will not have ownership of GERD. What an embarrassment to Ethiopia. Ethiopia should clearly know the water share. How much is our share? Besides, why can't Ethiopia use its own water for irrigation? That is totally a sovereignty issue Ethiopia should secure. They (the 2 downstream countries) had done an agreement based on shares, why they did not do the same this time? That would have resolved our 3000 years of rivalry. All I see is a collection words that gives no power on its own dam. Rather the agreement should be based on the amount of water share each and every country should have. Why is it all focusing on GERD anyways? They have built dams without Ethiopian consent. Look carefully, if the other 2 downstream countries build new ones and ask Ethiopia to release more water to fill the new dams, GERD may not have water someday. This document is all about GERD. But if Ethiopia singes such a trash document, eventually Ethiopia will not have ownership of GERD. What an embarrassment to Ethiopia. Ethiopia should clearly know the water share. How much is our share? They had done an agreement based on share, why they did not do the same this time? That would have resolved our 3000 years of rivalry. I don't see any harm with signing the negotiation. It doesn't say the dam won't be used for farming. As GERD is located in remote area, it needs a fortune to take the water to a suitable agricultural area at this stage. We've natural talent, there is nothing we can't do once our mind is made up. So, I say lets wait for a moment, use the electricity, fishing... etc, & with the profit we get, we'll accomplish our mega farming project. Who knows, we might even be Egyptians food basket. Well, this is a good start. However, the principles of the agreements are blurred. However, it can be taken as an ice break for the three countries for further negotiation and far better from the colonial agreement which denied Ethiopia total access to use the water. Let us wait and see tomorrow. I still do not trust the two countries in general and Egypt in particular. Egyptian government must be aware of what the Ethiopian government is up to.The government in Addis is a dangerous gagsta that is with a sold out soul.It is bent to please the neo-colonialist right wing groups that will try to choke Egypt in the future.Egypt must not let the dam built period,If they go ahead built it it is over.The tigrayans that are ruling Ethiopia are with a heart that is filled with hate to Islam follwers.Read their brutal leader Atse Yohannes"s history. He was killed in the war against the Mahdis of The Sudan.I hope president Al Sisi play smart with the evil Ethiopian government. So far President Sisi approach to the Nile issue is very positive for all people of the region unlike the former ignorant leaders.